We’d love your help. 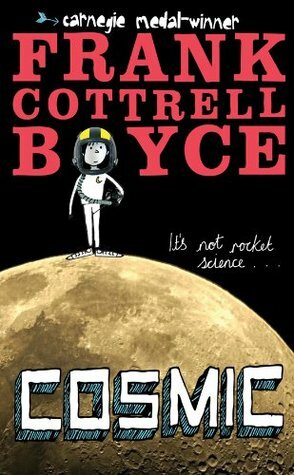 Let us know what’s wrong with this preview of Cosmic by Frank Cottrell Boyce. To ask other readers questions about Cosmic, please sign up. Who thought this was their favourite ever book? Reply if you do! Books that should be made into movies! Close your eyes. Lean back. Take a breath. Now think. Think about the books you read when you were a child. Think about the ones you loved. The ones you still think about sometimes. The ones that encouraged you to consider the world around you. Got them in your head? Great. Now just pluck out for me the ones that took place in outer space. Go on. I can wait. What’s that? You can’t think of any significant children’s books that took place in space? Would The Little Prince count? I guess so, but th Close your eyes. Lean back. Take a breath. Now think. Think about the books you read when you were a child. Think about the ones you loved. The ones you still think about sometimes. The ones that encouraged you to consider the world around you. What’s that? You can’t think of any significant children’s books that took place in space? Would The Little Prince count? I guess so, but that’s not really the kind of space I mean. I’m talking about real space. The kind we blasted into in the 1960s and then never returned to. Where are the books about kids in space that have remained within the public consciousness? Fact of the matter is, there aren’t any. Oh, there are tons of books where kids go to space, sure. But how many of them are classics? How many of them are memorable? How many could you tell to the person on the street and get a spark of recognition in return? For now, none. But let me call you back in fifteen years and maybe your answer will be different. Because by then Cosmic by Frank Cottrell Boyce should hopefully have found its readership. And if it has, we’re one step closer to having a space-based chapter book that everyone can enjoy. What happens when a twelve-year-old boy goes through such a growth spurt that he looks like he’s thirty? Well, in the case of Liam, inadvertent space travel. All right. Maybe not all that inadvertent. Liam’s a pretty good kid, but looking like a grown-up has gotten him into sticky situations. There was the time he was the only kid tall enough to ride the roller coaster, which in turn led to him getting free rides (and freaking out his dad). The time he almost got away with driving a car out of a dealership. And then there was the time he found himself on a rocket hurtling through space without knowing how to get it back. That sort of brings us up to speed because when the novel opens, that’s where Liam still is. He sort of won a contest for the world’s greatest dads and conned his classmate Florida into pretending to be his daughter. And then they sort of got flown to China where she was going to be one of the first kids to go to outer space. And then he kind of sort of won a competition to be the legal guardian that went along with the kids. Only now something has gone wrong and Liam’s finding that being the “sensible adult” is a lot harder when you want to scream and yell and run around like all the other kids freaking out around you. Instead, it’s up to him to get them safely home. Big job. Big kid. Consider one mister Frank Cottrell Boyce. Here we have a man who has written books like Millions and Framed. He’s sort of a one-namer writer. And his shtick, as I see it, is to write books that star boys, have high-concept ideas, are laugh-on-the-subway-and-get-strange-looks funny, and then also make you think about life, death, the universe, and everything in it. Millions paired boys finding two duffle bags full of money with questions about God and Jesus. Cosmic, for its part, pairs the story of a twelve-year-old who looks thirty with ample consideration of the eye of infinity and our place in the universe. Put that in your pipe and smoke it. This then is a book that’s amusing for all kids, but will make some of them consider the big picture as well. Now admittedly, I wasn’t hooked on Cosmic from the get go. The beginning was fun, but then Liam started to get into trouble and I was less amused by that. And about the time he was making a fool of himself in front of the real dads in China, I was positively embarrassed for him, and not sure I’d want to pick up the book again. But when Liam started competing with the other dads to become the one that went into space, I was hooked again. And after that the story just got more and more exciting. The multiple near death experiences didn't hurt either. After a while I realized that some of this book feels a bit like the movie Big. A kid gets a body of a grown man and suddenly the world is his oyster. The difference of course being that in Big the boy can go back to looking like a kid and in Cosmic Liam will just have to grow into his. It occurred to me after a while that adults reading this book would identify with it immediately. You find yourself in the body of a grown-up and everyone starts expecting you to act like a sensible human being with responsibilities? That’s my life every day! No wonder Liam eventually thinks to himself, “What’s the point in forfeiting your childhood if all you get for it is filling in forms?” So obviously grown-ups are going to relate to Liam, but would kids? Well, sure! Talk about the ultimate wish fulfillment. To live in the world and find yourself getting free rides at the amusement park, free car rides, and all the perks that go with the job . . . where’s the downside? Boyce shows the downside, but I don’t know how many kids will care. The fact that Liam’s a hoot to go along with (even when he’s being impossibly thick) was just a nice plus. After all, Boyce is a funny writer. He knows how to craft a good line. Example A: “I don’t think the world has vanished. But it is worrying not being able to see it. After all, Earth is where I keep all my stuff.” When Liam’s dad tells him to get a friend who’s not an online companion his argument is, “You need a friend who is visible to the naked eye.” And Boyce is the master of funny (and always pertinent) chapter headings like “The Ice-Cream Man of the Gobi Desert”. It’s also just a great book about dads and how important they are. Adults reading will understand pretty early on that Florida’s supposedly perfect father that she's always comparing Liam to is just a figment of her imagination. In fact, fathers are sort of the most consistent theme of the book. Early on Liam comes to the conclusion that his dad only speaks on five separate topics of conversation. Then, when he finds himself a kind of pseudo-father, he steals his dad’s book on how to talk to teens, and finds himself in the old man’s shoes. Finally, even when he’s in the most trouble, Liam can’t help but think that his dad may still find him, even in the farthest reaches of space. It’s this childlike faith that keeps reminding you that for all his posturing, Liam’s really just a kid like the rest of them. And when Liam acts like a kid, it always makes sense. He doesn’t do it randomly. He just reacts to situations like a child would want to and the result is sometimes funny, sometimes disastrous. Which in turn makes his sacrifice at the end all the more impressive. Some may feel that the book is too doggone English to appeal to American kids. I don’t. The Britishisms aren’t a problem, though I did have to look up what a satnav was. Ditto haribo. Not that they aren’t easy to look up, but you may scratch your head a little when you run across them. Still, kids today have grown up on a steady diet of Harry Potter. In nine out of ten occasions they’ll be able to parse what it means when Liam says of chips, “the moment they make contact with your tongue they stop being crisps and become soggies.” Honestly I worry more about the celebrity gossip repeated by Florida. I’d like this book to age gracefully, but its technological references and mentions that Tom Cruise’s teeth are completely false may make it difficult to peruse thirty years from now. Interestingly, the book I pair this one with in my head is actually Moonshot by Brian Floca. Now, granted, Moonshot is a picture book and Cosmic is a wordy bit of fluffy genius, but the two share one significant thing in common. They have a good solid appreciation of that feeling of awe and fear we have sometimes when we gaze up at the moon. When Floca writes, “They go rushing into darkness, flying toward the Moon, far away, cold and quiet, no air, no life, but glowing in the sky,” how different is it from Boyce when he says, “The surface is white as paper and the shadows are sharp and definite” and later “The stars were getting just a bit dimmer. Like someone was drawing a curtain over them. But I knew what was behind the curtain now. Behind the curtain was everything, and I was nothing.” In both cases, the authors are dealing with a feeling that writers for centuries have grappled to put to paper: wonder. Wonder and awe. These are books that look into the blackness that surrounds the earth and presses upon us from all sides, and makes it manageable and comprehensible to young minds. They acknowledge the fear and they counter it with beauty. Fifteen years from now, I like to think, I’ll meet you again. And I’ll tell you to close your eyes. I’ll tell you to lean back. I’ll tell you to take a breath and to think. Think about a book about kids in space that is memorable, classic, and in the pubic consciousness. And maybe, just maybe, your eyes will flutter open and you’ll shoot me a pitying look of mild disgust as you say sarcastically, “Uh, like ‘Cosmic’? Hello?” That’s what I’m shooting for right now. Because as novels for kids go, Boyce has managed to write one that’s just the right mixture of fun and philosophy. Kids will love it and grown-ups will love to read it with them. Doesn’t matter how tall or short you are, because Cosmic is for you. I read this with my 10 year old son for his book club run through a local independent book store, and we really enjoyed it! It is a genuinely humorous and well-written middle grade book. No surprise as the club facilitator is an absolute book genius when it comes to kids and YA titles. I don't know whether to be surprised or not to find that none of the other parents read the book. Am I unusual for reading the books my kids are reading? Genuine question. I just like to enjoy the books with them a I read this with my 10 year old son for his book club run through a local independent book store, and we really enjoyed it! I don't know whether to be surprised or not to find that none of the other parents read the book. Am I unusual for reading the books my kids are reading? Genuine question. I just like to enjoy the books with them and talk to them about what they read. Indeed he is not. He’s not even on Earth. With that small, understated sentence Boyce hooks us up with his twelve-year old narrator, Liam, a “great lad.” Great as in being really tall; tall enough to ride any amusement park ride he wishes, tall enough to drive, tall enough to be repeatedly mistaken as an adult. Say on his first day at a new secondary school as a “gifted and talented” student when he is initially identified as a teacher. Great as in being really, really good at the multiplayer online role-playing game, World of Warcraft. Great as being really smart and really brave. Great as in having a sweet and thoughtful and sensitive way that stands him in good stead when he ends up in a rocket coming back from the moon. Who think he is a dad. Boyce gets Liam’s voice just right. A screenwriter, he knows how to set-up scenes, create engaging dialog, and make a completely improbable situation believable. As he did with Millions, Boyce brings in deep philosophical ideas in a kid-friendly, convincing, and moving way. With this one it is about dads, about what it is to be one, what it is to be an adult. To the book’s readers, Liam is convincingly a kid throughout his story, even as he convinces the adults he encounters that he is an adult. And not just any adult — an adult just like his dad. A completely lovely book; highly recommended. * The book will be published in the US in July, but is already available at audible; thanks to Kelly Herold who alerted me to this fact. I read this book aloud to my nine year old daughter and Cosmic was in parts 'totally cosmic'. This was a strange book, the main character is a 12 yo boy who is very tall, has some facial hair and often gets confused as an adult. The characters are from a small town called Bootle in England, which is somewhere near Liverpool I believe. So I needed to watch a bit of Red Dwarf to practice my Liverpudlian accent before we started. The young lad enters a competition with Drax World, a mobile phone co I read this book aloud to my nine year old daughter and Cosmic was in parts 'totally cosmic'. This was a strange book, the main character is a 12 yo boy who is very tall, has some facial hair and often gets confused as an adult. The characters are from a small town called Bootle in England, which is somewhere near Liverpool I believe. So I needed to watch a bit of Red Dwarf to practice my Liverpudlian accent before we started. The young lad enters a competition with Drax World, a mobile phone company building a theme park in China. He pretends to be the Dad of one of his class mates, a girl who he has a typical 12 yo relationship with. Said relationship becomes confused when they realise that acting as her dad allows them to go and do things normally not allowed for two 12 year olds. This is a modern day Charlie and the Chocolate factory. A group of Dads and their chosen child end up at the theme park in China training for the greatest ride ever, a shot into space and back. The dads all have their particular hangups with their kids, ie buying what ever they want, pushing to be a winner in everything or removing fun to focus on learning, Very Veruca Salt and Mike Teavee style. What changes the story is the fact that one of the dads is 12. So reading this aloud was interesting, because there was much in there for the parent to think about when pushing your kids to strive for success, excellence or even tidying their room. The book seemed to be broken into two parts, there was a fun kids story in there and then there was lots of descriptive stuff about flying around the moon and thought processing of feelings. A big chunk of the last third of the book lost its fun part and I could tell my daughter was, whilst still interested, wanted to return to the fun bits, not the relationship bit. It was a little strange, it was almost if the author had designed this book to be read aloud by a parent to a child between 9 and 11. But I don't know many other friends who still read to their kids when they get past 6. For a long time, the book was heading for a four. We had a lot of fun for most of the book and had some laugh out loud moments. I had a raft of accents to play with, kids from different backgrounds. My Liverpool and french accents were way better than my middle east accent. So overall we enjoyed the book and the chapter sizes were good for a chapter a night. I would say my daughter would rate this as a 4 star overall as in most nights she was hoping for an additional chapter as she wanted to keep the story going. What a hoot! Easy to suspend disbelief despite ridiculous premise. Mostly funny, both clever and slapstick. Also some tender & wise & exciting bits. So glad I was alerted to this; hope to read more by the author. This book is what happens when you take a Roald-Dahl-style premise and give it a heart. It's warm, humorous, and told in a fantastically convincing middle grade voice. In an unusual turn for a middle grade novel, it's also a reflection on fatherhood, and as our young protagonist attempts to be "dadly," (why? long story) readers are reminded of how awesome dads really are. I've had this ARC sitting on my shelf for a few months now, and if I'd known how much fun it would be and how much I'd like it, I would have read it as soon as I got it. But it's a new author for me, and the blurb didn't make it sound all that interesting. Since this North American edition is due out early next year, I thought I should probably get reading. And it turned out to be just what I needed: a funny, laugh-out-loud, wistful and rollicking ride that reminded me at times of Roald Dahl (mo I've had this ARC sitting on my shelf for a few months now, and if I'd known how much fun it would be and how much I'd like it, I would have read it as soon as I got it. But it's a new author for me, and the blurb didn't make it sound all that interesting. Since this North American edition is due out early next year, I thought I should probably get reading. And it turned out to be just what I needed: a funny, laugh-out-loud, wistful and rollicking ride that reminded me at times of Roald Dahl (more on that later). Liam is only twelve, but his growth spurt hit early. Now taller than most adults and sporting a new batch of stubble, he's mistaken for the new teacher on his first day of grade 7 at a new school. That lasted only so long as it took him to try to incite a walk-out, but it's only the first time he's mistaken as an adult. Since he looks about thirty, Liam and his classmate Florida have great fun doing things that kids can only do with adult supervision - until his dad, a taxi driver, catches him about to test drive a Porsche. All that practice at pretending to be Florida's dad comes in very handy when he wins a competition to be among the first people to visit a new, state-of-the-art space-themed theme park in China. Faking a letter to his parents about his class going to the Lake District for a school trip is easy enough. The only problem is, he needs someone to be his child, to take along with him, because the competition is for a parent and child. Convincing celebrity-gossip-obsessed Florida is only part of the problem: when they arrive their host, Dr Drax, tells them that it is the four children who will be going into space. Their fathers will be staying behind. To come so close and not realise his dream! He manages to convince Dr Drax that the children should have an adult present, but Dr Drax decides to let the children vote on which Dad they want with them by voting on them after a series of challenges. Problem is, why would the kids want a computer-game obsessed "dad" with them when they know he'll hog the controls? Frank Cottrell Boyce is better known as the author of Millions, which was made into a movie. I haven't seen it, or read the book. Other reviewers have said it's a better book than Cosmic - considering how much I enjoyed this, perhaps I should read Millions too. Cosmic is an utterly delightful read - and I've been waiting for ages to say that about a book! Liam is a funny, engaging narrator, a mix of precocious child and wise adult who is obsessed with the Waterloos of the world and a role-playing computer game called World of Warcraft (which comes in very handy for navigating his way through encounters with grumpy adults). He carries the novel easily. When you remember how much practice Liam has at pretending to be an adult, and of having adults who know he's a kid always expecting him to behave better, "big lad like you", it's not all that surprising. Sure, sometimes his voice was a little too mature, but it also has that naïve youthfulness that you leave behind before you hit 20. Usually. The humour renders the implausibility of the plot unimportant, in that Hitchhiker's way. This is one of the first books I've read in ages that made me laugh out loud. It was a breath of fresh air, lightening my week, and some of the irreverence transferred to my own life - there's nothing better than the ability to laugh at the absurdities of our own lives. The story is told by Liam from space, and is the story of how he got there. I haven't been so entertained in ages. It really is a silly story, and yet poignant at times too - it's no shallow, brittle kind of humour, but earnest, which also makes it just that little bit sad. There's also this pervading sense of ... something, possibly bad, because all through the book you know that these five children are stuck in space, orbiting the moon, completely cut off from Earth and home and their parents. It certainly did prove how bad an idea it was of Dr Drax's to send just children into space - they messed up their task because they were fighting over who got to press the green button. I think the author was counting on the fact that nerds from different factions don't mix. Meaning that reader nerds don't play online games and gamer nerds don't read kids' novels. Well as an elementary school librarian children's literature is my business (and fortunately for me also my passion). My husband is a big gamer and I play with him. So I guess I qualify as that rare (possibly statistically non-existent) double nerd who both reads children's books and plays an online game. The main char I think the author was counting on the fact that nerds from different factions don't mix. Meaning that reader nerds don't play online games and gamer nerds don't read kids' novels. The main character in this book. Liam is a devout World of Warcraft player (he has a level 40 avatar) and uses his "knowledge" of World of Warcraft to get out of sticky situations in the bizarre new world he has been sucked into, the situation of being stranded in outerspace 239,000 miles from home. The trouble is that the author actually knows virtually nothing about World of Warcraft. Honestly I think he went and sat in the hallway of some random World of Warcraft convention and wrote down a few terms and phrases then stuck them into his limited model of video games. I am guessing a lot of pac man as a child. The Warcraft references were almost all completely incorrect as to the real gameplay. Having said that and putting the game aside I thought this was a very cute story and that Liam is a likable character. It was sweet and tame enough for middle graders but enough adventure to keep kids a bit older engaged. Naar de maan is een super schattig boek over de twaalfjarige Liam die met zijn lengte iedereen voor de gek houdt. Hij is zo groot, dat mensen denken dat hij een volwassene is. En zo belandt hij aan boord van een ruimteschip. De schrijfstijl is heel grappig en het verhaal vertederend. Echt een leuk kinderboek! A hilarious story about a young boy who finally feels at home in himself and his unusual size. Cosmic illustrates the extreme consequences of lying as well as the immense power that comes with responsibility and friendship. I thoroughly enjoyed this book! Funny, adventurous and educational. Might have to read this one whole-class. It's a coincidence I began this on the night of the lunar eclipse, or maybe I just have space on the brain? Actually, not really. It's up to me to note books that get stars from major trade publications, and this book has a whopping SIX. Cottrell Bryce owes a lot to Roald Dahl's Charlie and the Chocolate Factory, and I say this in the best way possible. One, they're both British. Two, they live for caricature and the funny. Three, their books are just whimsical enough, and serious enough, to hit It's a coincidence I began this on the night of the lunar eclipse, or maybe I just have space on the brain? Actually, not really. It's up to me to note books that get stars from major trade publications, and this book has a whopping SIX. Cottrell Bryce owes a lot to Roald Dahl's Charlie and the Chocolate Factory, and I say this in the best way possible. One, they're both British. Two, they live for caricature and the funny. Three, their books are just whimsical enough, and serious enough, to hit that sweet spot where you only have to suspend disbelief just a little. I mean--a twelve year old who can truly pass for an adult? A theme park "thrill ride" that's actually a trip on a rocket... into space? For kids? And it's real? Oh yes. Liam's voice is wonderfully wry and hilarious, and he also coined a word that's going into my vocabulary: dadliness. The quality or attributes of being a dad. What does a dad do? He gets you out of a tight spot, and then glares at you disapprovingly until you learn your lesson. He calls you "princess" and remembers your birthday. He pushes you to succeed. He'll do anything to save you. More than that, Cosmic is also a muse on what it means to be a grown-up, as well as a dad, so I can easily see why industry magazines are showering it with stars. While I think it's authentically written in the voice of a 12-year-old boy, I'm neither twelve nor a boy, so I'd be interested in what middle school kids think of this book too. All the best books about parenting are written for children. There's a contest and a tour, so a strong homage to Charlie and the Chocolate Factory. Boyce makes his kid characters okay despite the horrible parenting they receive though, so that's nice. The best thing, though, is that the kids manage to lark about and have fun, and also get stuff done. Liam makes a great dad, although it's clear he'll enjoy going back to being a kid. Whereas Charlie is deserving because despite his unspeakable pover All the best books about parenting are written for children. The best thing, though, is that the kids manage to lark about and have fun, and also get stuff done. Liam makes a great dad, although it's clear he'll enjoy going back to being a kid. Whereas Charlie is deserving because despite his unspeakable poverty he doesn't complain or challenge the system, but Liam earns his reward for working hard and challenging the status quo. I don't recall ever thinking that I would get to vacation in the moon some day, but it is pretty to think so. This story is truly cosmic. Cottrell really has a great sense of humor and writes in a way that made me laugh out loud. The main character Liam is easy to relate to, even if you're not a 12 year old bearded boy. Even though it is not likely that a middle school boy can pose as an adult and get launched into space on a crazy mission, I was so absorbed in the story that I believed it could happen! This book was enjoyable enough, but didn't quite make it for me. Too much "Golly, gee, I have to act like an adult". I read (well...listened to) this book because my fourth grader's teacher is reading it to his class. He recommended I read it, and I am so very glad I did! What. A. Book! The plot is clever, it is incredibly well written, parts are laugh-out-loud funny, and the author does a great job of capturing that funny time when a child wants to be older but still needs the comfort and security of their parents. The story: Liam has a growth spurt of epic proportions. This puts him a head or two above his cl I read (well...listened to) this book because my fourth grader's teacher is reading it to his class. He recommended I read it, and I am so very glad I did! What. A. Book! The plot is clever, it is incredibly well written, parts are laugh-out-loud funny, and the author does a great job of capturing that funny time when a child wants to be older but still needs the comfort and security of their parents. The story: Liam has a growth spurt of epic proportions. This puts him a head or two above his classmates, and he's constantly being mistaken for an adult. Specifically, he's mistaken for his friend's dad. The friend and Liam take advantage of this and enter a Best Dad Ever contest, which promises to let them experience the best thrill rides ever. It ends up that this thrill ride involves space travel, and the process of deciding who gets to go is funny and great and a great conversation-starter for kids (and grown ups if you're reading alongside). I liked it, I didn't love it. It was entertaining and for the most part held my attention, but there were places where I got bored. It wasn't because of a slow pace, or Mr. Boyce's writing style--both were good--it was because I never really liked the protagonist and I had zero interest in his goal. This was partly due to the fact that I was unsure of his goal for most of the book. The story had a tendency to ramble directionless. My impression was that Mr. Boyce was trying to emulate Terry Prat I liked it, I didn't love it. It was entertaining and for the most part held my attention, but there were places where I got bored. It wasn't because of a slow pace, or Mr. Boyce's writing style--both were good--it was because I never really liked the protagonist and I had zero interest in his goal. This was partly due to the fact that I was unsure of his goal for most of the book. The story had a tendency to ramble directionless. My impression was that Mr. Boyce was trying to emulate Terry Pratchett's comedic style, without Mr. Pratchett's story sense. What did I like? I liked Mr. Boyce's relaxed, fun (and occasionally funny) writing style. He was writing in first person (which makes this style easier), and his pace was fast. This book took a pretty out-there premise and just had so much fun with it. Our narrator/protagonist, Liam, is delightful. It was super sweet to watch him gain an appreciation for and emulate his own father's "dadliness." Also, kind of wild, but this book is quite a bit less out-there now than it was when it came out 10 years ago. I described a character to my husband and he was like, "So basically, that's Elon Musk." Yep. Extra star for the narration. I looked forward to driving places so I could listen to this in the car. Great main character and original plot. Loved this book! As usual with Frank C-B it is full of comic set-pieces, that could be little short stories on their own. But it also has emotional depth, and the ending is brilliant. A joy to read, especially out loud. One of the Best books I have read or even the best, it is science fiction. I really liked this book it was a little of a slow start but amazing in the middle. I was really addicted to this book and the plot. I recommend this book to who likes sci fi and anyone 9+because of the vocabulary might be advanced for some younger kids. I loved the storytelling and the humour, but most of all I loved the space scenes and the description of that experience of seeing the world from far far above. I think it nails what that must feel like emotionally. Liam doesn't quite fit in. He is twelve-years-old, but he looks... well... like a dad. A lot of the time, this works to his advantage. On the first day of middle school, his principal thought he was a teacher and introduced him in the school assembly. Once he went to a car dealership, and the salesman almost let him take a Porche out for a test drive. I was completely and utterly charmed by Cosmic. How has this book not received more attention? Liam is the kind of student I would love to teach - clever, independent, adventurous, and kind. He is constantly pushing the limit to see how how far his adult appearance can take him (test driving a Porche? ), but it's clear to the reader that he isn't really trying to take advantage of people, he just likes to have big adventures. Florida Kirby reminded me a little too much of, well, me. She may not know anything about gravity or outer space, but she knows every single celebrity, who they're married to, and how they became famous. Her primary goal in life is to become famous herself, and playing the role of Liam's daughter (yes, they're the same age!) just might get her there. Boyce did a masterful job of allowing Florida to evolve over the course of the story. She could have easily remained a shallow fame-seeker, but as the story progresses the reader gets to see more and more of Florida's heart and internal motivation. In case you couldn't tell, she's my favorite. Cosmic gets a big gold star for the fact that it is so appealing to both children and adults (particularly parental-type adults). Much like a great Disney movie, the humor throughout exists on two levels: there are plenty of jokes to keep kids laughing, but there is another, more witty layer of humor that will get grown ups chuckling too. And did I mention that author Frank Cottrell Boyce lives in England? I was smitten with the British vocabulary sprinkled throughout. In fact, I frequently found myself reading with a mental British accent, and a big smile on my face, because seriously... doesn't a British accent make everything just a little bit better? Finally, Cosmic is a story with a heart. All of the main characters, but especially Liam and Florida, learn what "dadliness" is really all about. In a way, this book is like a laugh-out-loud love letter to dads. I thought this was a great book. I loved the characters and the whole story behind him going to space.I really enjoyed this book and I hope everyone who reads it does too. I first discovered Frank Cottrell Boyce through his movie, Millions. I later went on to read the book which was very good but somehow, for me, failed to live up to the movie. Framed however blew me away. When I finish a book I like to rate it out of 5 and this book was definitely *****. The hilarious story is a family drama set in a small Welsh town, where nothing ever happens. Until the day the entire contents of the National Gallery are moved into the local slate mine for safe keeping while Lo I first discovered Frank Cottrell Boyce through his movie, Millions. I later went on to read the book which was very good but somehow, for me, failed to live up to the movie. Framed however blew me away. When I finish a book I like to rate it out of 5 and this book was definitely *****. The hilarious story is a family drama set in a small Welsh town, where nothing ever happens. Until the day the entire contents of the National Gallery are moved into the local slate mine for safe keeping while London recovers from flooding. The book is warm and touching and absolutely hilarious, and introduces art to the reader in a fresh and funny way. I've read it many times, and every time I do, it gets better and better. Go read it, I say. So it was with some excitement that I began Cosmic. And indeed much of what I love about Framed is featured within - a somewhat eccentric main character with a passion for some obscure topic (saints in Millions, Teenage Mutant Ninja Turtles in Framed, and World of Warcraft in Cosmic), mistaken identity resulting in comic consequences, unashamed references to pop culture, and a warm, touching story which highlights the importance of family. The main character, Liam, who is unusually tall for his age, is mistaken as a dad and attends an extreme theme park with his pretend child and accidentally ends up in Space! As I've said, all the things I loved about Framed are in there, but I think that's where I have the problem. TOO MUCH of Framed is in there! I really was expecting something fresh and new. I also found the plot to be totally bonkers - unbelievable, and very far-fetched. So for me, it's 4 stars. In my high school American literature class we were asked to do a book review at the end of the marking period on Good reads. So this quarter I was having a little trouble getting a good book to read, but my brother was reading a book called Cosmic. At first I did not think that this would be a good book for me because it was about science and I’m not that good in science. But after reading this book it showed me a lot about myself, it also showed me how much we care for things. These are only a few reasons why you should read this book. You should read this book because if you try to make a connection to this book of some of the things this kid in book say you find yourself going into deep places. For example he talks about the stars in the sky and he says he never really pays attention to them until one random day. That had me thinking to myself wow when the last time I looked at the stars was. In utter shock I wanted to read more and more. I grantee that if you give this book a chance and read this and you will feel the same. This book also shows you how much you care for things and or who you care for. The kid in this book states the point that He keeps his favorite things close to him. These made me think what my favorite things are and do really want to keep them close to me. I made me think how much does it mean to me to and what are my favorable things. But over all this is a good to me when reading I started taking simple sentence and thinking about them in details. If this book made me do this it could possible make you or even more. You find this on good reads it most likely there. Frank Cottrell Boyce is a British screenwriter, novelist and occasional actor. In addition to original scripts, Cottrell Boyce has also adapted novels for the screen and written children's fiction, winning the 2004 Carnegie Medal for his debut, Millions, based on his own screenplay for the film of the same name. His novel Framed was shortlisted for the Whitbread Book of the Year as well as the Carne Frank Cottrell Boyce is a British screenwriter, novelist and occasional actor. His novel Framed was shortlisted for the Whitbread Book of the Year as well as the Carnegie Medal. He adapted the novel into a screenplay for a 2009 BBC television film. His 2009 novel Cosmic has also been shortlisted for the Carnegie Medal.